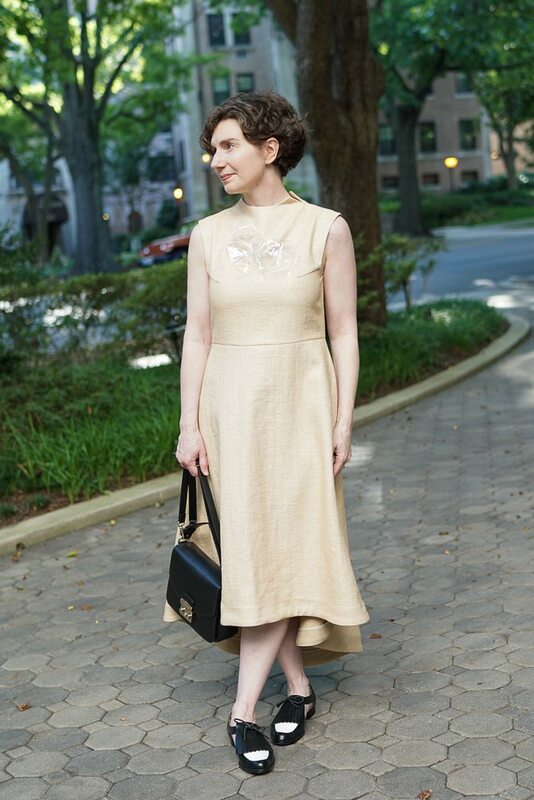 Long-time readers may remember that I call special dresses “Fifty Cent Dresses.” If you want to know why, you will have to read this earlier post. If you are willing to accept the term Fifty Cent Dress no questions asked, then you can proceed post haste to photos and descriptions of this summer’s special dress. There is no lesson today. No styling tips, no guidelines. I am just showing you a dress. 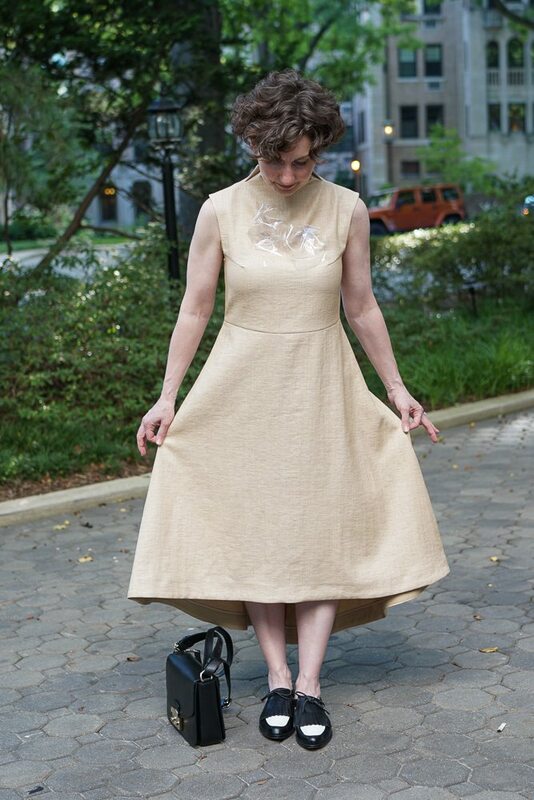 But it’s a fun dress, despite being beige. Shall I demonstrate the fun? Perhaps the fun in this dress is not immediately obvious? Allow me to show you a few perspectives and then the details. 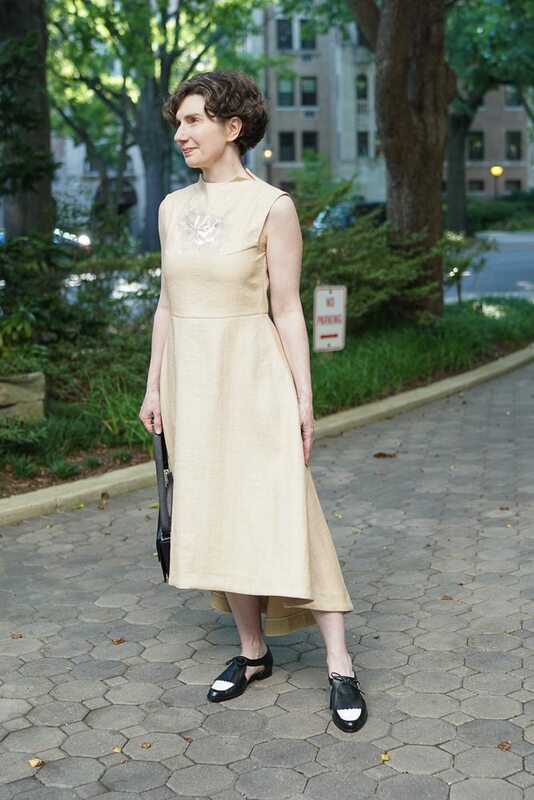 What do you think of my business casual ball gown? This dress is all about the cut. And the fabric, I guess. So it’s about two things: the fabric and the cut. The fabric is a cotton-polyamide blend and it feels slightly laminated. I know that sounds crazy and I have no idea HOW it will survive a trip to the drycleaner — the label says “professional dry clean” in tiny letters — but it feels wonderful. It’s crisp, but flexible and light. The cut has great severity (you know I am into clerical robes), but the skirt bells very gracefully. Note the high neckline has vents. It’s a small, but interesting detail. And now we must discuss the crowning touch: the brooches that came with the dress. 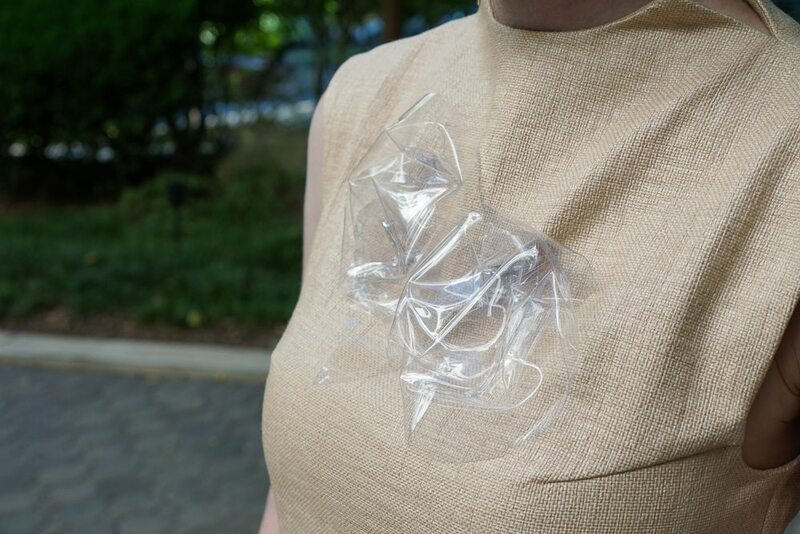 The designer called them “detachable transparent plastic brooches inspired by jellyfish.” I am sure you can imagine that my eyes practically started spinning in opposite directions when I read that. 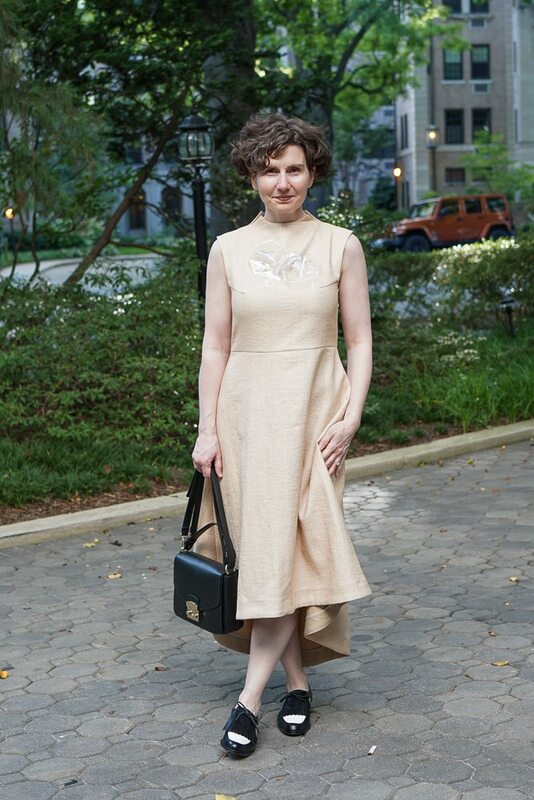 I wore this dress to the National Symphony Orchestra at the Kennedy Center on Saturday night. During the intermission, I went out to the terrace to enjoy the air and a little snack. As I was walking back into the concert hall, a woman caught my eye and made a gesture toward her chest and then FROZE in HORROR. 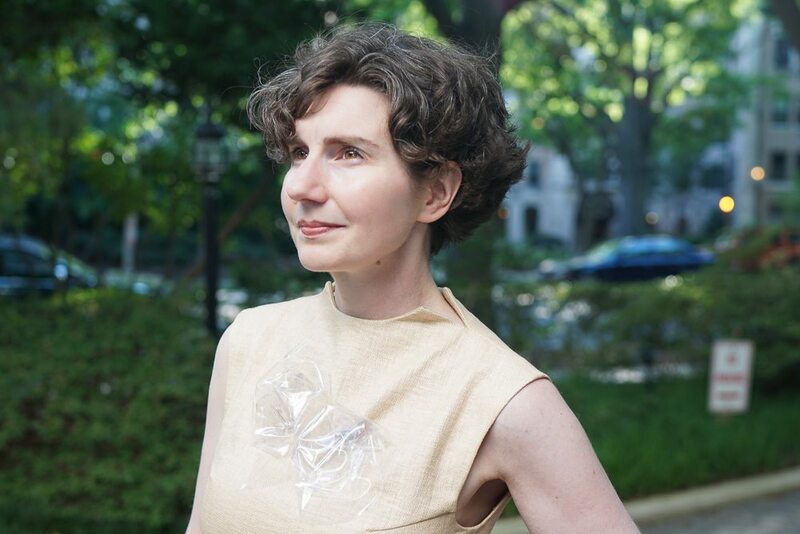 I feel certain that she was about to tell me that I had a clump of saran-wrap stuck to my dress and then realized that the clump was stuck with intentionality. I am not sure if she was mortified on her own account (believing she had made a horrible faux pas) or mine (horrified that someone would leave the house with garbage pinned to her dress), but she should sleep easy. She was making a humanitarian effort and I appreciate it, even if she misapprehended the facts. I am generally suspicious of jewelry that comes with garments because it often looks cheap when it is not intended to. Here, there is no pretense. These brooches are not supposed to look like precious metals. They are 100% plastic. Their value resides entirely in creativity, humor, and joie de vivre. (1) If this dress were pea green or coral pink, it would be the most perfect thing ever. (2) I wore these cut-out brogues because I felt this dress needed a summery shoe and these were the only summery shoes in my closet. I still haven’t retrieved my sandals from the storage locker in the basement. This dress would look nice with platform sandals or a low peep-toe heel. 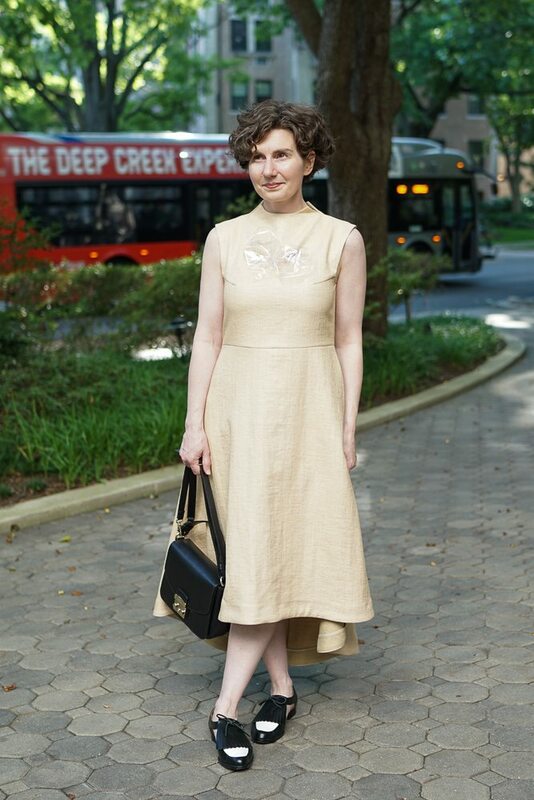 (3) I asked The Photographer, Can I wear this dress to work, or is it too dressy? He said I could, but then I wondered why I was asking him. He is a self-employed writer who does not know the difference between a dress and a skirt and constantly disparages social conventions. Clearly, I asked him because I wanted permission to wear this dress to work. But I should be asking you. What do you think? My only hesitation is the length of the skirt in the back. Many thanks for your excellent blog recommendations. I looked every one of them up and now have some new sources of amusement and inspiration! For those keeping score, The Pieced Wonder was also A.W.A.K.E. Note: Fatima added the darts at the bust for me. Without them, the armscyes were a little too big. But of course you MUST wear it to work. Don’t deprive those people. 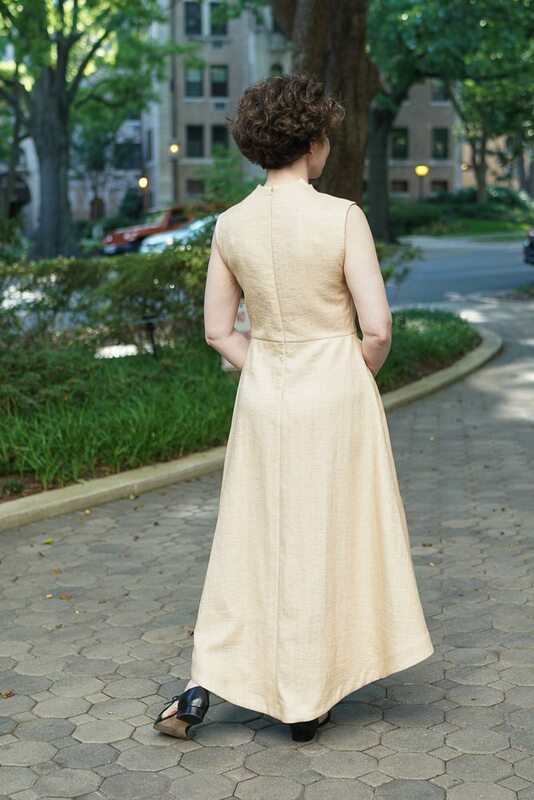 This is a midi-length dress, in a neutral colour, with some interesting detail to the skirt ie. totally fine for work. But if I was venturing suggestions, perhaps something black at the neck – a scarf ? a brooch ? some beads ? 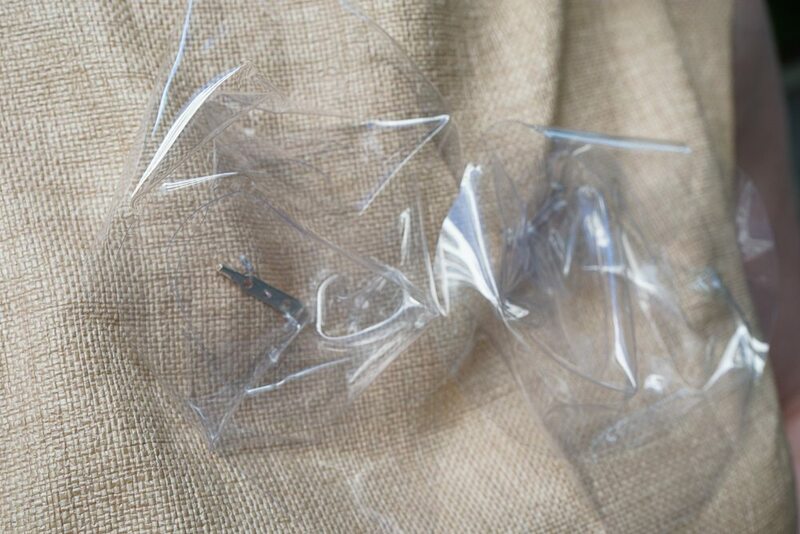 – would do better than the saran-wrap brooches at delineating where the dress stops and the Directrice’s neck commences. An interesting idea, MC Bontemps. I wasn’t sure if a necklace would interfere with the slits in the neckline, but after some quiet contemplation, I think that one of my silver cable-stick necklaces (the one with the onyx beads) would be very pretty with this dress. Thank you for suggesting it! The dress works and should be worn many times. The look is unique but not off-putting in any way. The drape is phenomenal and I remember some of last year’s sandals that would be cooler and add their color as well. Bravo! I’m with Susan. Save it for special. I’m in the “save it for special” crowd, too. And I love the description of the “brooches” and the story of the brooches at the Kennedy Center, but not the brooches themselves. I don’t think it would be a good choice for work unless you can be beamed there .My concern would be the metro so unless you plan on driving in to work, I suggest save the dress for evening wear. 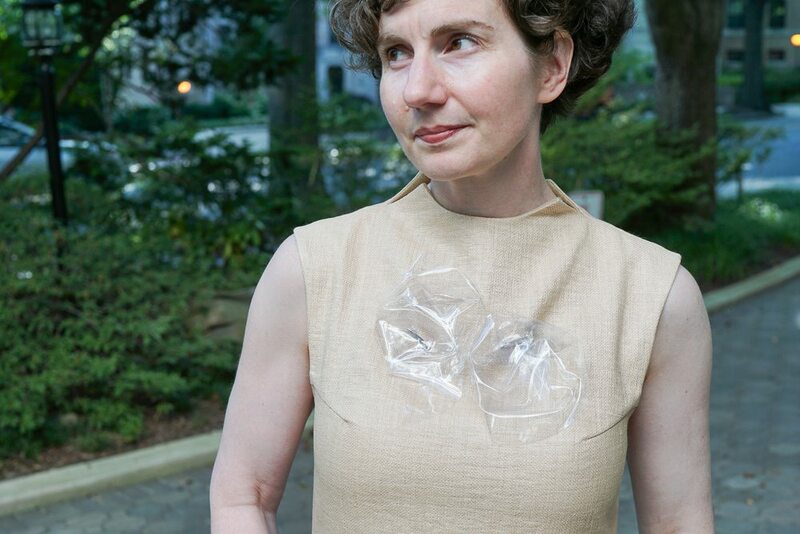 I like the dress,but the Saran Wrap has to go! Enhance it with some of your lovely jewelry or scarves. Yes, yes! To the office? Definitely! Although if it was a luncheon I might swop out the saran wrap for something more colourful, so as not to confuse. I forgot to say that I love the dress! The cut, the color (for you), the gleam of the fabric. 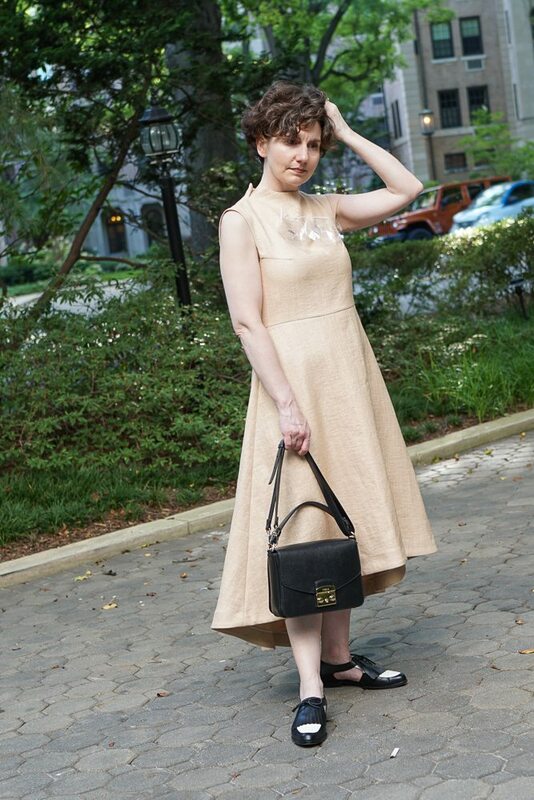 And I love the story of the fifty-cent dress. Oh, this dress is beautiful, what a wonderful shape. Furthermore, you appear to be one of those rare souls who is luminous in beige. But you could always have it dyed if you continue to wish it were another colour. 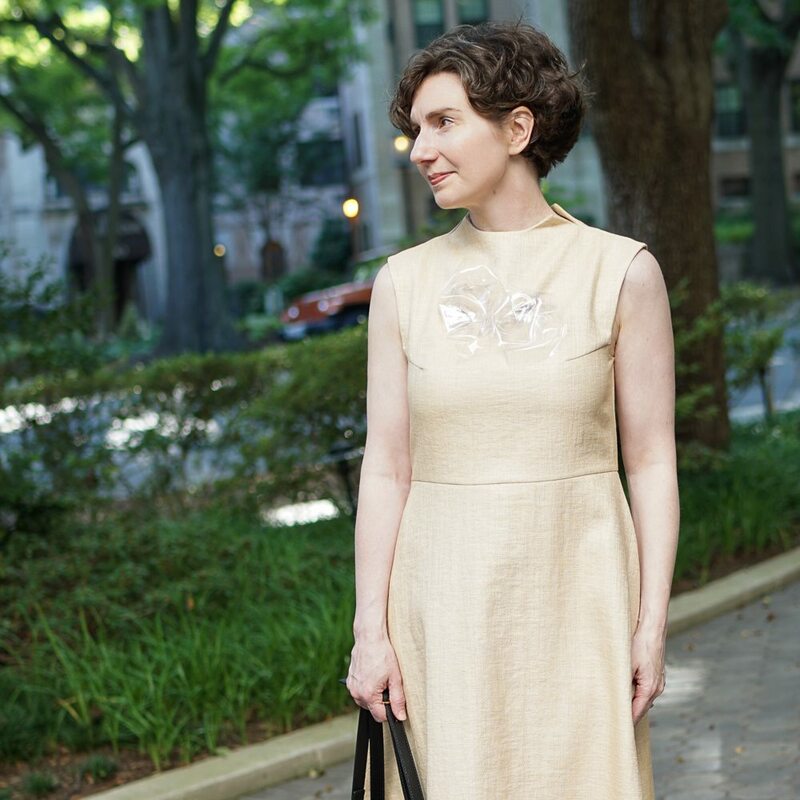 Catching up on posts and I am enchanted by this dress. I like the brooches – love the space-agey contrast with the demureness of the dress. I would place them in a more brooch-like spot. You’re always an inspiration!